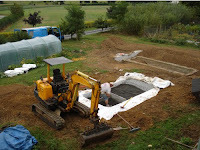 Permaculture Design – Wildlife Pond : dirty “grey” water from our house goes into our new horizontal plant filter and the cleaner water that comes out runs into a wildlife pond. I must admit to not having understood the purpose of the pond when Eléonore came to do the étude (study) of our proposed installation, digging holes and pouring water into them. 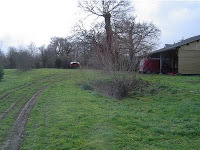 She was seeing how the water would infiltrate the land, i.e., how our treated water would soak into the landscape, whereas I thought that she was working out whether or not we needed a pond liner. We were therefore happily anticipating a beautiful wildlife pond to go with our “reed bed”. Aquatiris, the company who are supplying our system, are modifying and improving their systems as they go, working in association with SATESE, the people who authorise and regulate individual sewage installations, here in Brittany. 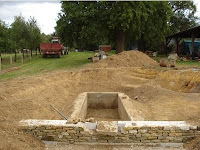 The size of filter, for example, has changed and the regulators have been testing water as it leaves the plant filter, meaning that the wildlife pond seems to be superfluous now and we could simply drain our water into the large ditches that habitually run alongside French country roads. But we had our hearts set on a wildlife pond so we decided to make the investment in something beautiful and go for it. Our references were books and the Internet, bien sûr, and our top book recommendation to help you design a wildlife pond is the refreshingly small and slim volume Ponds and Water Features published by the Royal Horticultural Society. Permaculture is all about design and although I can do it, measuring, surveying, drawing, thinking, I’m not sure I always have the patience for it. I’m one for grabbing the spade and plugging the power tools in straight away. I also find that however much planning and reflection we do before we get started, there are possible improvements that only come to light after the experience of doing it. 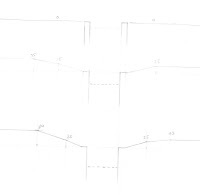 Anyway, we did the planning and the pics (from top to bottom) show the pond it was before we moved in, section drawings of how the land was to better imagine how we should approach the landscaping, a sunpath diagram (one of several we did) to work out where best to place the plant filter (“reed bed”) a cross section, long section and plan of our proposal, building the plant filter, landscaping the pond (showing my concrete dam hidden behind Paddy’s beautiful stonework) and then me getting cold and wet placing the pump. The central rectangle of concrete is an old slurry pit from when this used to be a farm. 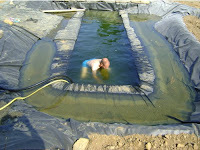 Too big to remove, we made it the centre of our pond. In my next blog, I show you photos of how it all looks now. Looks impressive. All that's missing, as far as I judge, is a diving board.